Gluten free pastry is blah in comparison to beautiful buttery shortcrust. I’ve tried really hard to prove myself wrong but testing a multitude of recipes and experimenting with different flours has simply reinforced that there is no substitute. I had a light bulb moment as I was cooking with my grand daughters last summer. It came to me as the kids were squeezing coconut macaroons mixture into crazy shapes that miraculously baked into whacky macaroons with a crispy shell and chewy middle. I had visions of sweet tartlets, with citrus curd in a crunchy coconut shell. 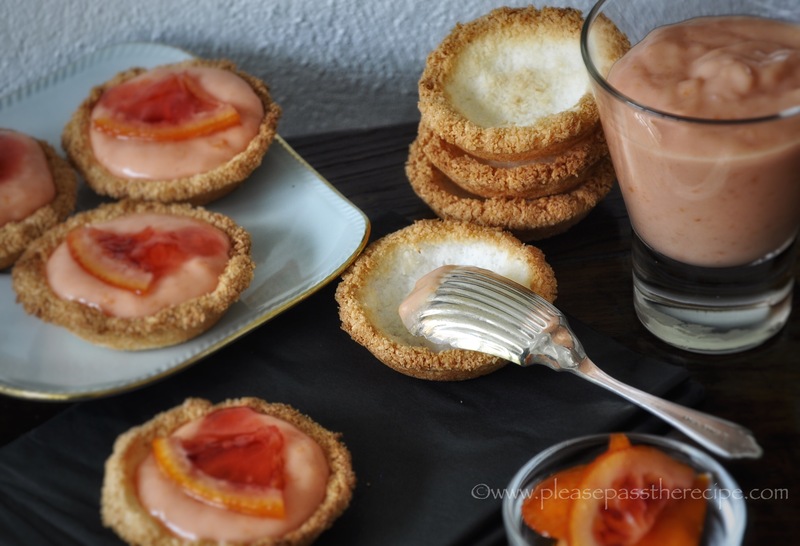 Blood oranges season became the reason the try out my coconut macaroon tartlet theory. I made a batch of curd with the deep ruby red juice for starters then made the coconut mixture. It was fiddly moulding the sticky coconut into the tartlet tins, but it became easier as I went along. After a short stint in the oven out came robust golden brown tart shells. The coconut and curd were seriously good together, a delicious way of enjoying a citrus curd tart for the gluten intolerant. Lightly oil 2 trays of tartlet moulds and place a small square of baking paper into the base of each. Measure the coconut and sugar into a large bowl and mix to combine. Use a spatula to stir through the egg white. When almost combined use your fingers to ensure that the egg white is thoroughlt distributed. Squeeze heaped dessertspoons of the mix into balls then squash and mould each ball into a tartlet mould so that it’s tightly packed. Allow the shells to cool slightly before transferring to a cooling rack. When cold, generously fill with curd and garnish with toasted flaked coconut. *The tartlet cases will keep unfilled for a week in an airtight container. Do you ship? 🙂 They look delicious. I must have read this post via FB Sandra and only just now realised I didn’t make it back to comment on WP. Such a great idea to make these little tart shells from coconut! It reminds me of some biscuits I used to make years ago that had similar ingredients, but also with lime zest and chopped macadamias added – will have to make them again one of these days! Here I am still thinking about your wonderful curd from the other day and you’ve posted this! Macaroons are my favorite cookie. What a fabulous combination Sandra. Anytime we can have something sweet and leave out the gluten I’m in! Love macaroons! As others have commented, brilliant idea. These sound so tasty, along with that curd. I’m crazy for coconut, so I’m thinking these would suit me perfectly. what a great tartlet shell idea – love coconut. This is brilliant. I bet you could even get away with using a lot less sugar. Wow, thank you! I’d be nervous about reducing the sugar too much, it helps hold the coconut in shape. That’s inspired. And practically foolproof. This entry was posted on September 10, 2015 by ladyredspecs in Baking, Desserts, FODMAP diet, Food, Fruit Desserts, Gluten Free, Gluten free baking, Light dessert, Sweet mouthfuls and tagged coconut, gluten free, low fodmap, tart shells.